US ready to continue nuclear talks with N. Korea: State Dept. SEOGWIPO, Jejudo Island --The sundrenched southern Jejudo Island is known for its seafood plucked from the seabed by women divers and served up fresh and raw at beachside eateries. Yet, for visitors from the mainland, local food can be challenging to the palate. Slices of raw fish in cold soup is not to everyone’s liking and some food is just too bland for taste buds used to stronger seasonings. This difference in tastes is not lost on Kim Ji-soon, founder of the Institute for Preservation of Jeju’s Traditional Local Food. “Increasingly, local restaurants are catering to the tastes of visitors -- people from Jeolla and Gyeongsang provinces where a lot of seasonings are used. Add to this the influx of Chinese on the island and it is now difficult to find authentic Jeju food,” Kim told The Korea Herald on May 12 as she was getting ready for that evening’s Bounty of Jeju event at the Hyatt Regency Jeju, as part of the three-day Jeju Food and Wine Festival 2016 that ran May 12-14. 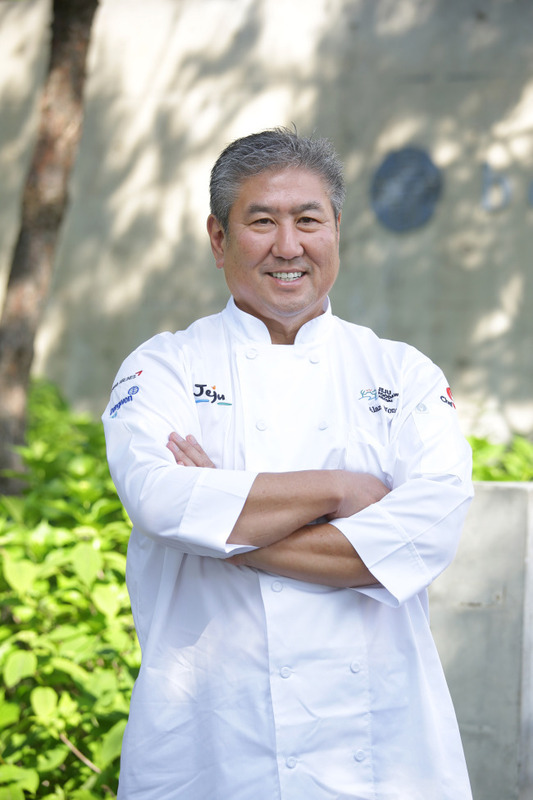 A certified master of Jeju cuisine, Kim was one of the 11 chefs from Korea and the U.S. presenting dishes highlighting Jeju’s agricultural products and seafood. Among the spread at her table were Jeju buckwheat rolls stuffed with julienned radish. “Not many people know that much of buckwheat that Koreans consume actually come from Jeju,” Kim pointed out. At chef Todd English’s tent set up in the scenic garden on a cliff, the pork belly-wrapped, makkeolli-poached lobster tail was redolent of the humble alcoholic beverage made with fermented rice. Josiah Citrin, owner-chef of two-Michelin-star Melisse in Santa Monica, California, took abalone, synonymous with Jeju, gosari, seaweed, radish and toasted buckwheat to create a wholesome broth, while chef Masaharu Morimoto served up steaming bowls of deep flavored Momosan chicken ramen with a chicken fat-based broth. Ming Tsai, owner-chef of Blue Ginger, took culinary creativity to new heights, putting together a plate of new-style Amberjack sashimi with Madras curry oil and uni-stuffed pyogo mushrooms. 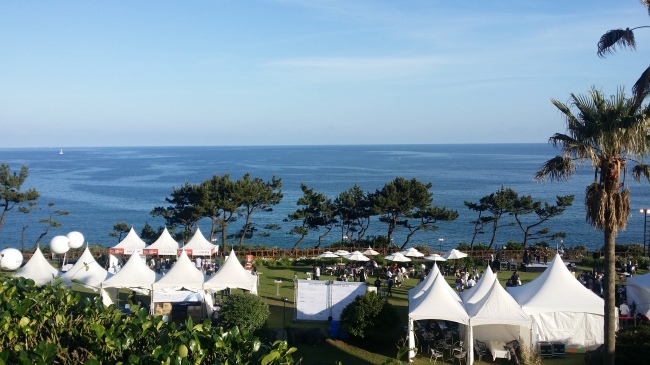 By aiming to highlight local cuisine and agricultural products, the Jeju Food and Wine Festival mirrors the Hawaii Food and Wine Festival which celebrates its sixth edition in October. 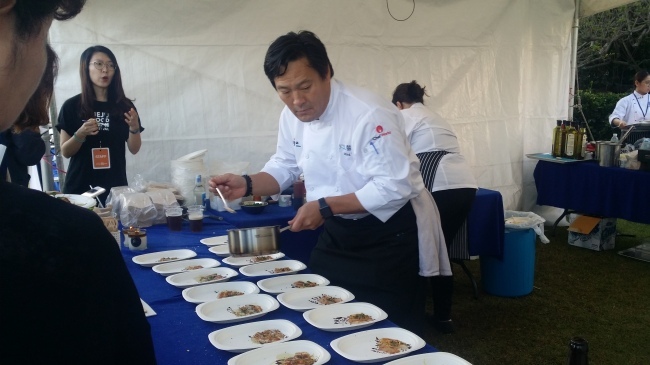 “The Hawaii festival spotlights tourism, culture, food, and produce,” said Alan Wong, owner-chef of Alan Wong’s in Honolulu, Hawaii, who cofounded the Hawaii Food and Wine Festival five years ago with fellow James Beard award winner Roy Yamaguchi. “Similarly, much of Jeju is included in the Jeju festival program,” Wong said. In a way, the changes Jejudo Island is experiencing in its culinary scene are similar to what occurred in Hawaii over a number of centuries. Wong explained how Hawaii’s cuisine was influenced by three larges waves of immigration to the island that was originally inhabited by Polynesians: The Portuguese whalers whose arrival, unfortunately, wiped out 66 percent of the native population with new diseases, and who brought with them chili pepper; the Asian imported labor who started arriving in the 1900s, many of whom eventually settled on the island and married women from Hawaii; and Hollywood’s taking up of Hawaii in the ’50s and ’60s and the subsequent boom in tourism. In the 1990s, 12 chefs formed Hawaii Regional Cuisine Inc. in an attempt to break away from the old continental cuisine. “It was an assertion that Asian culture had become mainstream and that we have our own reality now,” Wong said. Just as the Hawaii Food and Wine Festival is involved with local culinary schools, the chefs participating at the Jeju festival involved culinary school students in the program, offering master classes called “Grand Kitchen with Masters” at Cheju Halla University. Students watched keenly, their eyes following the chefs every move through large screens, while chefs showcased their skills and techniques. The students witnessed chef Todd English expertly prepare the famous Jeju black pig porchetta style, creating new taste by incorporating sesame oil and soy sauce into tomato sauce. Chef Josiah Citrin worked with black beef ribeye, native to Jeju-do Island, demonstrating how a sous-vide-like result can be obtained by frequently turning the beef while cooking and allowing it to briefly cool before returning it to the fire. In a segment that was as educational as it was entertaining, chefs Ming Tsai and Masaharu Morimoto, both Iron Chef winners, engaged in an impromptu battle. Speaking to The Korea Herald after his presentation, Morimoto, owner-chef of Morimoto, offered insights into promoting Korean cuisine abroad. “Korean food is already global. Most countries already have a Korea town,” said the Japanese-American chef who moved to the U.S. when he was 30 years old, just as the Japanese cuisine boom was happening there. “You just need more PR, need to be more confident, more proud,” Morimoto added. The key is to lower barriers to entry, he pointed out, offering the example of his signature tuna pizza -- a tortilla dough pizza topped with red onions and raw tuna. “It is about introducing the new with familiar ingredients. It lowers the hurdles to access, makes the entrance wider and appeals to a wider audience,” he said. Tuna pizza is served at many of his 12 restaurants around the world. Morimoto pointed out the strong presence of Korean-American chefs working in high-end, trendy New York restaurants. He also offered the example of chef Corey Lee’s Benu in San Francisco where the Korean-American chef subtly incorporates elements of Korean cooking into his offerings. “The priority should be on how to use your culture. I am lucky that I have sushi skills. Without it, I would not be here,” he said.